A lovely printed colored vine of iron on a textured background. This design can be modified for many color themes upon request. 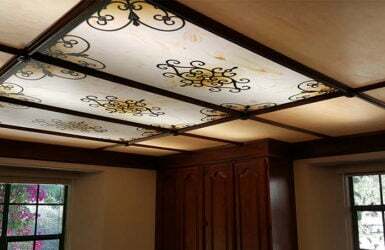 Hello, I just wanted to let you know I received my three decorative ceiling panels today [in Autumn] ! They are perfect !!! So happy I went with your company. Thank you for a job well done !! We love these! I cannot believe we did not think to do this sooner in our 20 year old kitchen! It looks fabulous! I have a condo with a very small gallery kitchen. 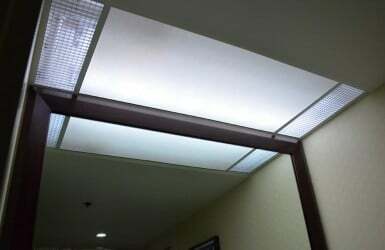 It originally had a white plastic panel covering a 12 inch deep cavity with a set of fluorescent tubes. It looked like from an office! 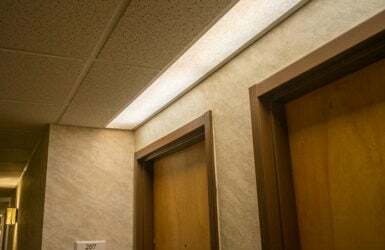 Adding 6500 watt fluorescent tubes with dark brown oak stained trim has made your 2x4 insert really stand out.... Thank you, the neighbors are all talking about the amazing transformation! First let me say I was very happy to find this company online after the generic panel in my kitchen broke while I was cleaning it. I could not decide between this panel or the Tuscan Iron so I ordered the samples. I was absolutely delighted with these! They look wonderful and are just what I was hoping for. They were packaged well and are very sturdy. What a difference they made in my kitchen. I will try to upload pictures soon. There were not any pictures of this particular style when I was shopping in this website but I'm so pleased with my choice. I ordered the Autumn version in .080 Lumieo. Amount of light my kitchen is just right through the panels. Thank you to the staff at Fluorescent Gallery! 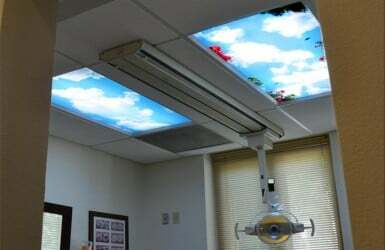 Fluorescent Gallery comment: This design does diffuse the light a bit more than some customers prefer for a kitchen. We recommended that Brian increase the brightness of the fluorescent tubes. We hope it helps. Love the panels! Easy to install. Made our kitchen look great. Thank you.